Their agenda may be on the rocks in the United States at the moment, but that doesn’t mean that the globalists are giving up. This new document does not mention what an appropriate threshold would be for member states, but we do know that Spain already bans certain cash transactions above 2,500 euros, and Italy and France already ban cash transactions above 1,000 euros. This is a perfect way to transition to a cashless society without creating too much of an uproar. By setting a maximum legal level for cash transactions and slowly lowering it, in effect you can slowly but surely phase cash out without people understanding what is happening. And there are many places in Europe where it is very difficult to even use cash at this point. In Sweden, many banks no longer take or give out cash, and approximately 95 percent of all retail transactions are entirely cashless. So even though Sweden has not officially banned cash, using cash is no longer practical in most situations. In fact, many tourists are shocked to find out that they cannot even pay bus fare with cash. In a truly cashless society, governments would be able to track where everybody is and what everybody is doing all the time. And in order to have access to the cashless system, people would have to comply with whatever requirements governments wanted to impose on their helpless populations. 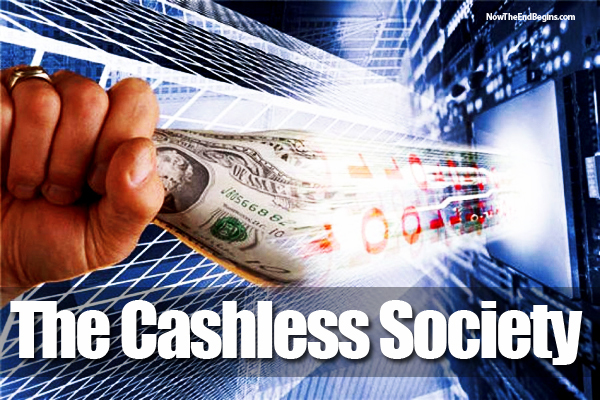 The potential for tyranny that this would create would be off the charts, but very few people seem greatly alarmed by the move toward a cashless system all over the globe. The time will come when you won’t be able to buy a cup of coffee without being traced, warns investment guru Jim Rogers. To control people, governments will increasingly seek to hunt down cash spending, he adds. “Governments are always looking out for themselves first, and it’s the same old thing that has been going on for hundreds of years. The Indians recently did the same thing. They withdrew 86 percent of the currency in circulation, and they have now made it illegal to spend more than, I think it’s about $4,000 in any cash transaction. In France you cannot use more than, I think it’s a €1,000,” said Rogers in an interview with MacroVoices Podcast. The reason why this is taking place all over the planet is because this is a global agenda. The globalists ultimately plan to completely eliminate cash, and this will give them an unprecedented level of control over humanity. One thing that many fear may someday be implemented is some form of microchip identification system. In order to access the cashless grid, you would need your “ID chip” so that the system could positively identify you, but of course there are millions of people around the world that do not intend to get chipped under any circumstances. In the old days, you would be labeled a “conspiracy theorist” just for suggesting that they may try to chip all of us one day, but in 2017 things have completely changed. State Sen. Becky Harris said a bill to prohibit forced microchipping of people is not as far-fetched as it might seem, because it happens in some places around the world. In a move that could be lifted straight from science fiction, workers at a Belgian marketing firm are being offered the chance to have microchips implanted in their bodies. The chips contain personal information and provide access to the company’s IT systems and headquarters, replacing existing ID cards. The controversial devices raise questions about personal security and safety, including whether they may allow the movements of people with implants to be tracked. Technology like this often starts off being “voluntary”, but then after enough people willingly accept it the transition to “mandatory” is not too difficult. We live at one of the most critical moments in all of human history, and the globalists are certainly not going to lay down and die just because Donald Trump won the election. The U.S. represents less than five percent of the population of the planet, and in most of the world the agenda of the globalists is on track and is rapidly advancing. The globalists want a unified one world economy, a unified one world religion and a unified one world government. The election of Donald Trump was a blow to the globalists, but it has also made them more dangerous, more ruthless and more determined than ever before. And in case you think that using the term “globalists” is a bit strange, the truth is that even the New York Times is using it to describe the global elite and their global agenda. We are in a life or death battle for the future of our society, and the globalists are never going to give up until they get what they want. So now is not a time for complacency, because the very future of our country is at stake.